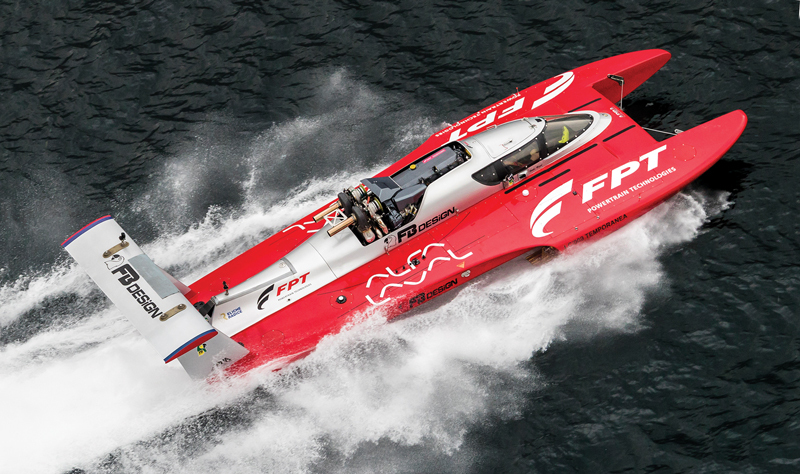 Last March on Lake Como, Italy, Fabio Buzzi set a new world speed record of 172.4 mph (277.5 kmh) for diesel-powered boats. 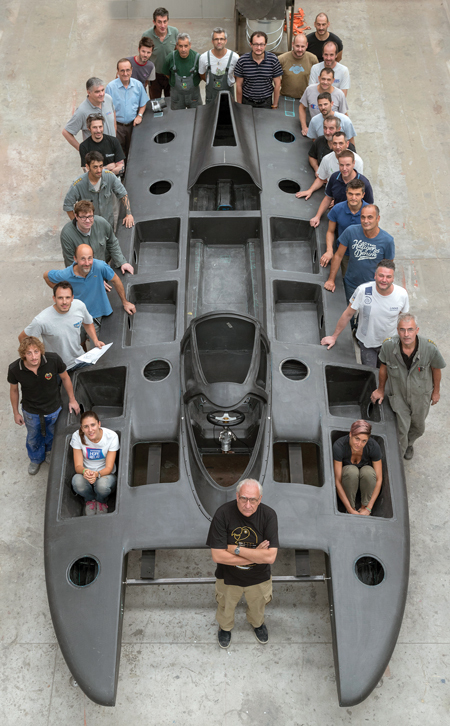 Last we visited with famed Italian powerboat designer, builder, and racer Fabio Buzzi was in 2016, when we published a Design Brief of his SAR 60 (18.3m), developed to help rescue refugees fleeing the Middle East for Europe (PBB No. 164, page 34). Not one to sit still for long, the 75 year old next embarked on a speed record with a 79-year history. Buzzi says the origin of the speed record for a diesel-powered boat was the German boatbuilder Gert Lürssen, who in 1939 zipped along at 42 mph (68 kmh). The first to exceed the 100 kmh (62 mph) threshold (of greater significance in metric countries…62 mph means nothing on our side of the Atlantic) was apparently American powerboat racer Don Aronow, who accomplished the feat aboard one of his Cigarettes in 1967. A succession of Italians continued to bump up the speed: Tullio Abbate (119 mph/191 kmh powered by a 6-cylinder in-line VM engine in 1978); Carlo Bonomi in 1982 (133 mph/213 kmh with an Isotta Fraschini engine), advancing again a wee bit in 1985 with a 5.7-liter Fiat diesel; and our man Buzzi in 1992, who ran his Seatek diesel, designed by his FB Design company, to 157 mph (252 kmh). That record held until this year, when Buzzi again teamed with Fiat Powertrain Technologies (FPT) to develop a new power plant. Buzzi describes it: “The record engine was built on top of an agricultural engine, mainly designed for the big combine of CNH [Industrial]. The original turbine on the side was making this engine too large, so a new water-cooled manifold extruded in aluminum was built, with two variable-geometry turbines, located on the back, side by side, in order to have a reduced front section and the dynamic air intakes of the two turbos perfectly in front. The plug was cut from epoxy by FB Design’s 5-axis milling machine. All parts were computer-designed with CAD/CAM and then the shapes were cut from high-density epoxy block with FB Design’s 5-axis milling machine. To avoid any possible distortion transferring from the plug to the final parts, these plugs/male molds were left in place for laminating the female molds on top. 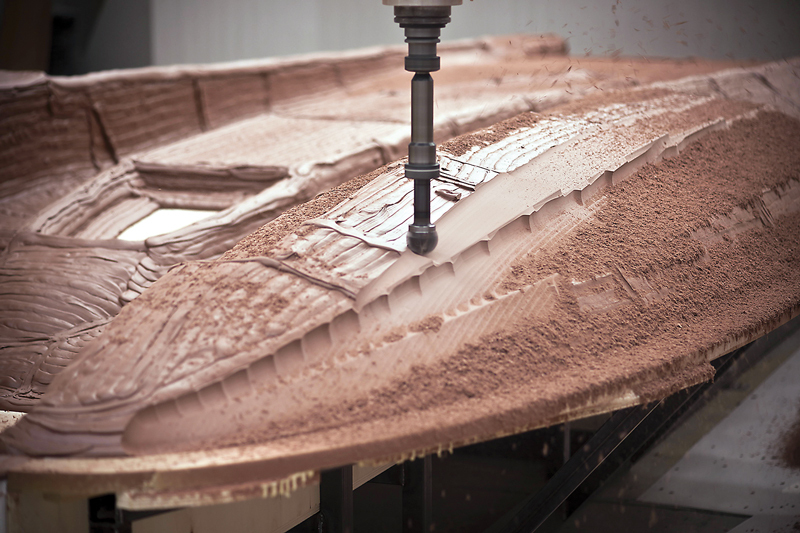 The hull and deck are prepreg epoxy with carbon-fabric reinforcements, baked in an oven. The bare hull weighs just 265 lbs (120 kg). After rigging, the boat weighs 5,798 lbs (2,630 kg), with the engine accounting for 3,351 lbs (1,520 kg). To make the boat unsinkable, Buzzi (standing in the center in the foreground) incorporated a series of boxes in the deck mold that later were filled with foam. Buzzi is adamant now that all boats be made unsinkable and says so in his edict at FB Design. To accomplish this, he says, “A new structure was invented, based on ‘boxes’ laminated with the deck and designed to match exactly the laminate of the hull. This creates an incredible light structure with a very high longitudinal inertial moment. That’s okay, but what about transversal structure? This was done with bulkheads in carbon fiber, reinforced on the top [of] two C-shaped profiles, done in prepreg UDR carbon, inside a 4-bar-pressure cabin. The result was a perfect carbon boat, all sandwich, with PVC on the hull and Nomex honeycomb on the deck, and a total weight of only 480 kg [1,058 lbs]. But up to this stage, it still was a boat that can sink.” That changed when the boxes in the deck were filled with EVA polyethylene waterproof foam. After repairs, and with inspectors from Guinness World Records present, Buzzi took the helm and on March 7, 2018, drove the hydroplane to 172.4 mph (277.5 kmh). FB Design, Via Provinciale 73, 23841 Annone Brianza (LC), Italy, tel. +39 0341 260105, fax +39 0341 260108, website www.fbdesign.it.